Strawberry shortcake was always my favorite dessert growing up. But we never made it with angel food cake or frozen strawberries. In my fam it was the real deal. My mom baked these sweet biscuit-like old-fashioned shortcakes, and topped them with sugared strawberries and fresh whipped cream. 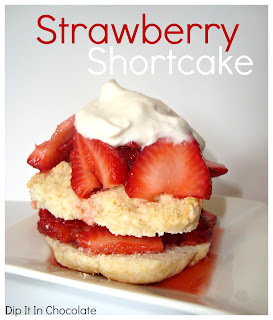 The great part is these shortcakes are made from Bisquick and take all of two minutes to whip up and throw in the oven. The recipe has been tinkered with quite a bit and adapted from Bisquick's original recipe. It is not at all the same as the one on the box. These shortcakes are thick and much heavier than angel food cake shortcake so know that before starting so you won't be disappointed. I so prefer this version and hope you will love it as much as we do. It has fruit and dairy in it so your dietician would probably approve.